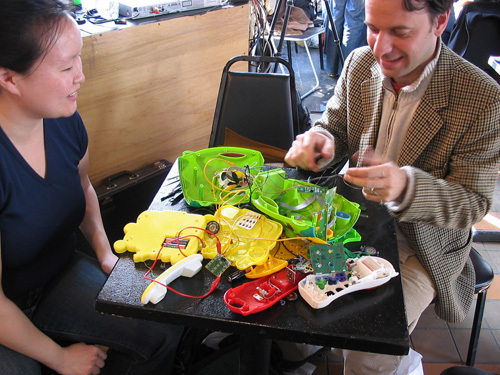 This week is just a powerhouse of music hardware hacking: while California gets ready for the Maker Faire, New York has the latest installment of the legendary BENT circuit-bending festival, BENT 2006. The entire week will feature performances, workshops (including the especially fun open play lab where you can try this yourself), and installations. Saturday night will also mark the launch of a new book on the topic, Nicholas Collins’ Handmade Electronic Music: The Art of Hardware Hacking. This year, the definition of circuit bending looks broader, perhaps, than in years previous, applying to all sorts of custom musical instruments and hardware inventions, but maybe that’s a good thing. I’ll try to make it over there, but I’m digging myself out of a project I’m getting ready for up in Boston this weekend presented by Boston Cyberarts. I also wrote about circuit bending for Make Magazine volume 04. The full version (and lots of other music hacks) requires either a subscription or a copy of the print magazine, but there is a free online tutorial on building an Incantor on Make online, from none other than the father of circuit bending, Reed Ghazala. Reed’s tutorial would be a perfect place to start. But, wait, there’s more: Get LoFi, the ultimate blog for circuit benders, has links to new renderings of circuit-bent devices in Flash, and videos on YouTube.